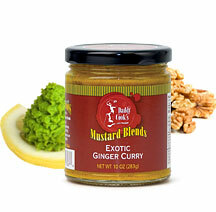 Anything goes in these unusual and awesome mustards. There is even a separate EXOTIC category at the World-Wide Mustard Competition. Definitely worth a try. Or, try the featured top-selling Exotic mustard by clicking the image at right!